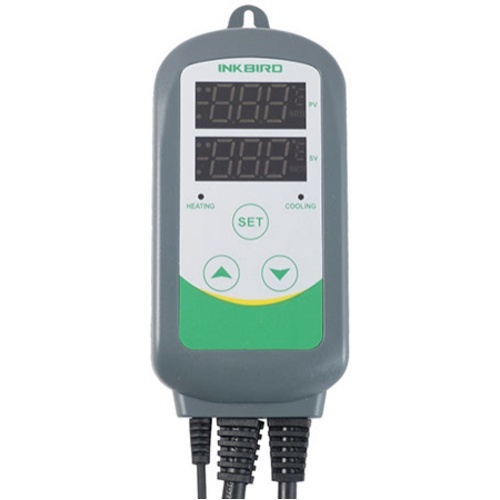 The Ink bird ITC-308S controller performs many of the same functions as the Ranco or Johnson but at a more affordable price, making it a great alternative for temperature control. 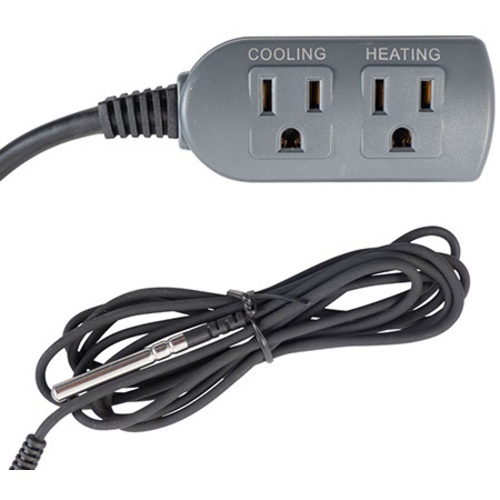 Aside from brewing uses, this is a great dual relay output temperature controller for cooking (use in a smoker or bbq), home growing (heat mats for seedlings, climate control), or any other DIY project you come up with! Temp control on standing freezer for fermentation control. budget friendly and looks like a quality product to get the job done. Christmas present for son, chosen by him. The dual stage control and plug and play ease. Recommended by others for making a fermentation chamber. Setting up a ferm chamber. bought new stand-up, frost free freezer. friend who uses this site constantly recommended this product. For use w/ "Ball and Keg Temperature Control Loop"
Purchased so I will be able to control the temp of my freezer to 50 degrees to brew lagers. Great reviews and decent price. I need it. I have an outdoor shed for my beer making but the temp differentials are huge. I currently have one and I like it. How does this work on a Kezzer? BEST ANSWER: Very simple. You plug the keezer into the Inkbird controller, then plug the Inkbird into the wall outlet. the allows a freezer to cycle on and off in order to maintain warmer temps than a standard freezer can do on it's own. We use this controller on a mini fridge we converted into a fermenting chamber as well as a huge 14 tap keezer we built. keep perfect temps. It sets temperature range for any cooling/heating appliance. It will allow a refrigerator to hold temperature above the normal maximum (about 58F) or whatever range you like. It can be used on a freezer also to keep it above freezing but still very cold. If you are using your kezzer as a controlled fermentation chamber, this would be ideal. My customers love this for lagering as well as raising temperatures for Belgians. Great product! Works great! I use it for my kegerator both at work, and at home, and its been going flawlessly for years 24/7! I use it for my kegerator and it works great. I just set the delay for compressor to 10 min. Our controller wont hold settings. It keeps going back to defaults. Very frustrating. Any thoughts ?
" SET key: press SET key for 3 seconds to enter menu for function setting. During the setting process, press SET key for 3 seconds to quit and save setting change." This has worked for me. If you release the button too early, it reverts to the previously stored setting. So 3 seconds after each setting or end? After you’ve entered all your settings, you hold the SET key down for three seconds and it should tmake your new settings the default. If it doesn’t, you may want to contact MoreBeer about an exchange. This is my 3rd InkBird Temp Controller. I have one controlling my 5 Cu ft keezer (fermenter) with a FermWrap heater and one for my 7 Cu ft. keezer (kegerator). I'm working on converting a wine cooler to a one tap kegerator/fermenter and will use this for temp control. This controller keeps the keezers within 1 F.
I've used it for 1 batch and it worked great. Plug and play, easy to use, not hardly!! Instructions confusing and poorly written. Had to read thru them numerous times and then trial and error to finally figure it out. Once you do get the hang of it, it works well and does the job. I read 1000 reviews for this on Amazon, home brew sites and on here. Great controller! I haven’t used the Johnson to compare, but this controller is plug and play. Accurate temp readings, alarm, adjustable temp points, no jumpers to mess with. I use this temperature controller for my keezer. Works as described and is a great value for the price. Best affordable temp control. I don’t currently use the heating functionl but handy to have both on a single controller. Own two and never a problem. Easy plug and play operation, love having the internal carboy temperature readily visible during fermentation. Hands down the best and easiest TC for the money. This temp. controller works just like it is supposed to. The price isn't bad either. It worked good through all my trials and my first batch is in the fermentation chamber right now. This thing works great! At one point I thought it was junk because it wouldn't turn on my freezer.....until I realized that I had it plugged into the heat plug instead of the cool. I would definitly recommend this. Wish MoreBeer sold these sooner. I have two other brands that cost more, but you have to choose between heating and cooling. Models that did both were even more expensive. This Inkbird unit provides accurate temperature control for both at a more affordable price. Easy, precise temperature control. Works perfectly. It controls my fermintation fridge and a heat wrap. Very affordable temperature control that is simple and has worked great for my keezer. I would definitely buy more for future projects. Great, inexpensive, very easy to use device. Works perfectly. Very easy to use. More easy to use than Johnson controllers. I have used this three different times and it has worked fantastic. A little hard to understand to set up so I went on to you tube and after, it was easy to set up. I needed it for heating the fermenters and it was within .4 to .9 of a degree. It would shut off and come on and kept the fermentation, Primary and Secondary right on every time. Before i tried it on my batches, i tested everything in a glass carboy with water and a heating wrap and a thermometer inside. The inside temperature was the exact as the Ink Bird Digital Temp. 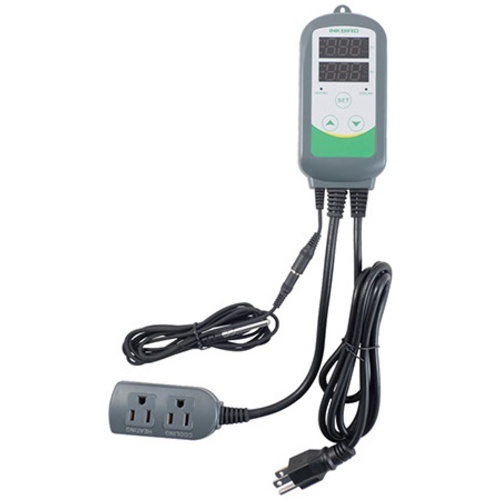 This temperature controller is easy to use and requires little to no fuss. Just plug it in set your temperature and go. It allows you to change how far from your set temperature the freezer will go both on the hot and cold side. I bought this to replace a 15 year old Ranco that just died (E2 code) on my leader. I really like the display showing the set temp and actual temp in bright, easy to see LEDs. Much better than the Tango display, and I loved the price to boot. Don't know about long term reliability yet, but so far I'm happy with the controller. This is a great product at a fraction of the cost of other products like the Johnson A419 (I have both and they work equally as well). I can assure you that this is one of the cheapest pre-wired temperature controllers on the market! Works great in any chest freezer or fridge for fermentation needs or for a kegerator. Very pleased. I now own two of these - one to control a fermenting refrigerator, the other to control my beer keezer. The first one I purchased went on the keezer, but when I needed to ferment a fresh brew, I took it out and replaced it with my Johnson Controls A419 (which is only a single-stage). As soon as I plugged the unit in, it read a bit warmer than the Inkbird had, which caught my attention. I calibrated the unit using my Thermapen, and the inkbird was off by 1.7 degrees after stabilizing. For the record, I bought a second Inkbird and calibrated it - it matched the Thermapen precisely in 32? ice water. Also another word of caution - the alarm settings don't adjust automatically with the set temperature. So when it was set to 68 degrees with an alarm at 60, and then I set the target temp down to 33 to cold-crash, I woke up in the middle of the night to the unit beeping because it had dropped below the 60? alarm. Of course, simply changing the alarm took care of the issue, and this is by no means a complaint - just something to keep in mind. The good news is the unit is VERY easy to setup for first-time use, and seems to do a wonderful job - I've already fermented several beers with my Inkbirds, set to a 1-degree variance from the target temp, inside a refrigerator with a Ferm-wrap heater, and I've been extremely pleased with the results so far. I love how easy it is to go from fermenting temps, to diacetyl rest, to cold-crashing with just a few button clicks. I purchased one of these off Amazon about a year and a half ago, and since bought a second. Originally used for keeping sour beers warm during fermentation, the second one I purchased was for my chest freezer to maintain temps while lagering. For the price there isn't a better temp. controller that I have seen. This is probably the best temperature controller I have used. I use it in a freezer with a paint can heater as the heat source. I have noticed great control at low temps and with that setup was able to ramp up to 86F on a Belgian Golden Strong with an outdoor temp in the 50s at night. Great value.